Spiroula is a dedicated, focused and driven woman who has the desire and talents to succeed – but it hasn’t always been this way. Spiroula struggled with the task of finding a job after mental illness that paid the bills but also inspired her after being diagnosed with a mental illness. When Spiroula first came to Campbell Page she was in the middle of what would be a 4 year mental health battle. Her main priority was getting better, and her Campbell Page Employment Specialists, Pritpal Signh and Cansu Kaman were nothing but supportive and understanding of this. Once Spiroula was feeling confident that she could being the task of finding a job after mental illness and maintain the job, both she and Pritpal began working on a career plan. Hairdressing was the only avenue that Spiroula was interested in pursuing. She had previously worked in a hair salon, but was limited to what tasks she could undertake as she was not fully qualified. At this time in her life she had started her Cert III in hairdressing however, due her health she never completed it. Therefore the first step was to get her enrolled in a Cert III course to ensure she would be fully qualified. Spiroula ended up completing her Cert III in 6 months which was a fantastic achievement. I had to keep myself motivated. It was either go downhill or get better for my son. Going downhill was not an option and that was the end of it. Being the determined woman that she is, Spiroula decided, under the guidance of Pritpal, that the next step in her path towards long term employment would be to complete her Cert IV. Both she and Pritpal worked on finding a Cert IV that would expand Spiroula’s skill set in the hairdressing industry and in business management, while also being financially achievable. I wanted to build upon my skills to get myself where I needed to be and Campbell Page helped me do that. It wasn’t long before Pritpal and Spiroula’s hours of research, resume writing and reflection on Spiroula’s career plan paid off. Heading Out, an industry leader and prestigious brand accepted Spiroula into their school of hairdressing. It has opened a variety of doors for me. I have met and shared the stage at Hair Expo with some of my biggest idols. I can see myself completing my training and finding a job after mental illness which is a big personal achievement. These kinds of experiences would have never been possible if my Campbell Page workers had treated me like a number and pushed me to get a job in any industry. 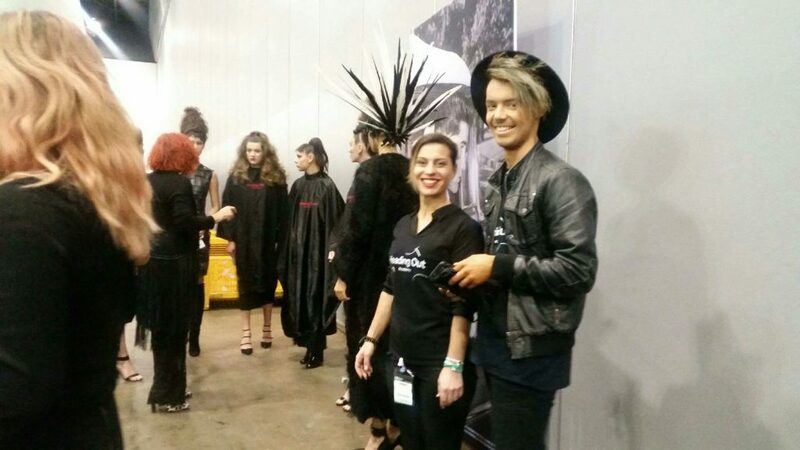 This month Spiroula attended Hair Expo at the Melbourne Convention and Exhibition Centre with her team from Heading Out. They worked for months in advance on the construction on extravagant Disney themed hair styles to be displayed on the main stage. Pritpal supported me all the way through, and continues to support me. I have built beautiful friendships with both her and Cansu. They further ingrained in me that there is always a light at the end of the tunnel, you just have to follow your dreams, work hard and never give up. Congratulations to Spiroula on making leaps and bounds in reaching her dreams and finding a job after mental illness! Everyone at Campbell Page is proud of you, but none more than your wonderful Campbell Page Employment Specialists, Pritpal and Cansu. At Campbell Page we transform people’s lives through securing long term employment. If you, or someone you know would like to start a journey towards long term employment with Campbell Page please visit our Contact us page for information on where to find your closest hub. Help is always available. If you or someone you know is struggling with mental health, please call Lifeline on 13 11 14 or visit their website.